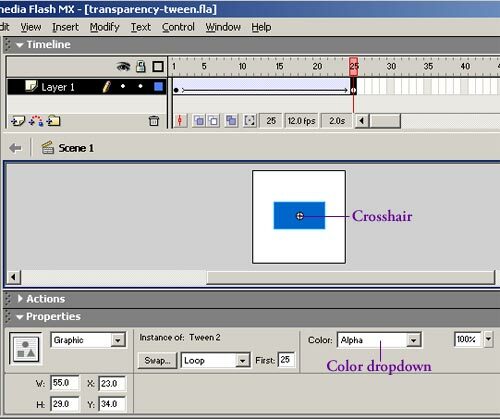 Flash tutorial on how to create a transparency tween, created Aug 2006. - Click on frame 25 in the Timeline, right click and select Insert Keyframe. 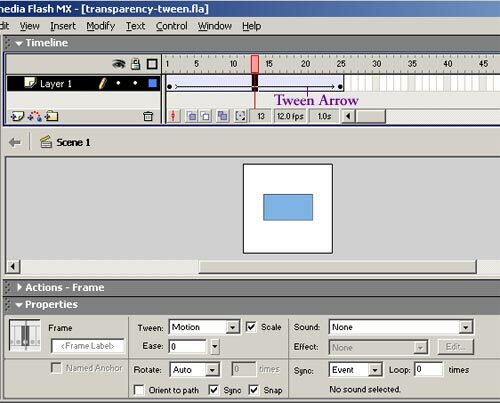 - Right click on any frame between 1 and 25, and select Create Motion Tween. Tween arrow should appear. - Click back on Frame 25, click on the crosshair that should now be present in the centre of the rectangle. The Properties window should then change to say "Instance of: Tween 2", and a Color dropdown will appear over to the right of the Properties window. Select the Alpha option from the dropdown, and give it a value of 100% in the far right dropdown.